WHY STUDY UKRAINIAN PER SE? Ukrainian is the language that opens the door to a young state with written documents that are a thousand years old, its unique culture, turbulent history, and national folk singing that is famous around the world. It is the language spoken by more than 50 million open-hearted, hospitable people. This is the language of a strategic partner in the political and economic life of the world. L’viv is considered to be the spiritual capital of Ukraine. Here Ukrainian comes to its own right as the language of all spheres, of cultural and social life. L’viv is one of the most beautiful cities in Eastern Europe, and is located at the intersection of various nations. L’viv is known for its mosaic culture: Ukrainians, Poles, Germans, Armenians, and Jews have created its intricate and paradoxical, yet harmonious, world. This is a city that is an open-air museum though at the same time a modern city of students, artists, and actors. 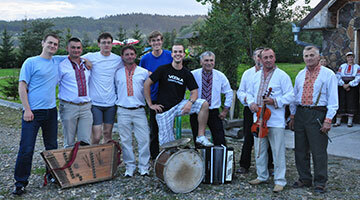 WHY STUDY AT THE CENTRE FOR UKRAINIAN STUDIES? The Centre is staffed by professionals from one of the most authoritative scientific and educational establishments of Ukraine – Ivan Franko National University of L’viv. L’viv University has a long-standing tradition of teaching Ukrainian language and Ukrainian literature. This is the very institution where the first department of Ukrainian philology was established (in 1848). 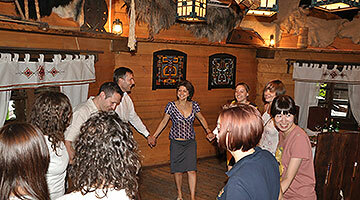 enjoy the unforgettable atmosphere of Lviv and experience true Ukrainian hospitality. The Center for Ukrainian Studies organizes language courses for different groups of students under the auspices of Ivan Franko National University of L’viv within the school year based on specific arrangements made in advance. In case there are enough students of the same language level, winter schools can be organized. Students who are over 18 years old may participate in schools. Younger participants need their parents’ written agreement to take part in the courses. The Center for Ukrainian Studies provides the opportunity for online studies of Ukrainian as a foreign language. All interested are required to fill out an online application form indicating their level of Ukrainian, previous experience of learning Slavic languages and a convenient time for lessons. The Center for Ukrainian Studies organizes round table discussions, seminars and conferences on the challenges of teaching Ukrainian as a foreign language under the auspices of Ivan Franko National University of L’viv. Teachers of Ukrainian abroad have the unique opportunity to gain and exchange experience during the International Summer School “Ukrainian Language and Country Studies”. Potential Summer School participants who have received scholarships from other public or governmental organizations of Ukraine or abroad are welcome to take part in the Summer School. Please negotiate the scholarship conditions with the School coordinators. The Centre for Ukrainian Studies announces a contest on reading the poetry of Ukrainian authors. The citizens of all foreign countries seeking to study the Ukrainian language and culture can take part in the contest, as well as Crimean Tatars who are living or used to live on the Crimean peninsula. Send the video file in MP4 format to the address of the Centre for Ukrainian Studies. The Department of Applied Ukrainian Studies of Ivan Franko National University of L’viv invites you to participate in the International Science Conference “The theory and practice of teaching Ukrainian as a foreign language”, which will take place on April 14 15, 2016. For me there was no better place to get to know Ukraine and to learn its rich language than L’viv. And there is no better opportunity to do so than the summer school at Ivan Franko University. 2016 The Center for Ukrainian Studies.